43056 This recall on 1/31/2012 involves Durus Challenge Cups, 7.8 oz. #43056, sold in seven different colors (white, green, ocean blue, sand, honey yellow, bone, and sunset orange). Read the press release and the customer letter for more information. 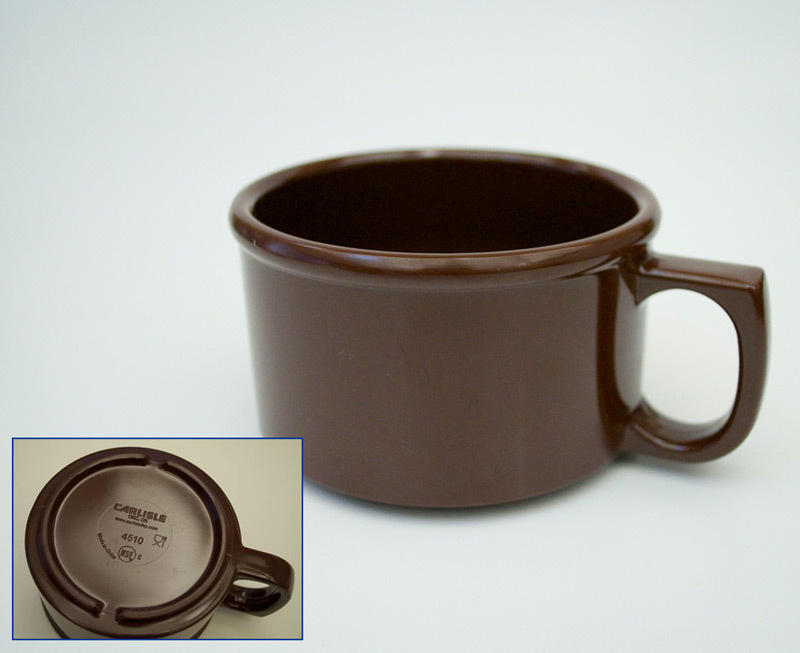 About 29,000 The mugs can break when exposed to extremely hot liquids, posing a burn hazard to consumers. 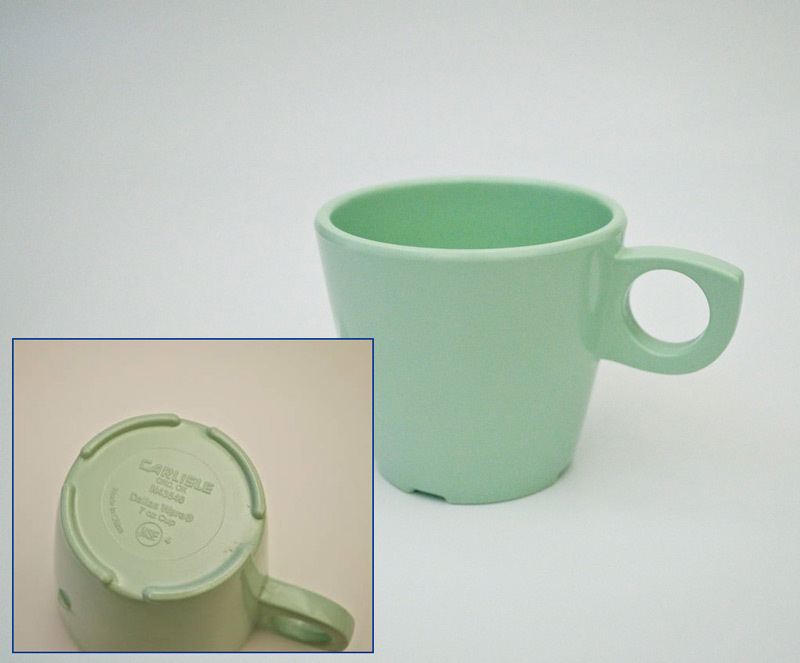 43870 This recall on 2/22/2012 involves Dayton™ Stacking Cup 7oz #43870, sold in a variety of colors, including white, green, ocean blue, sand, honey yellow, bone and sunset orange. The mugs are approximately 2 to 3 inches tall and are made of melamine. The bottom of the mugs have the name "Carlisle OKC, OK" and the model number imprinted on it along "Made in China" and "NSF." Some mugs may also include the model name and size, i.e. "Durus 7 oz cup." Read the press release and the customer letter for more information. About 111,000 The mugs can break when exposed to hot liquids, posing a burn hazard to consumers. 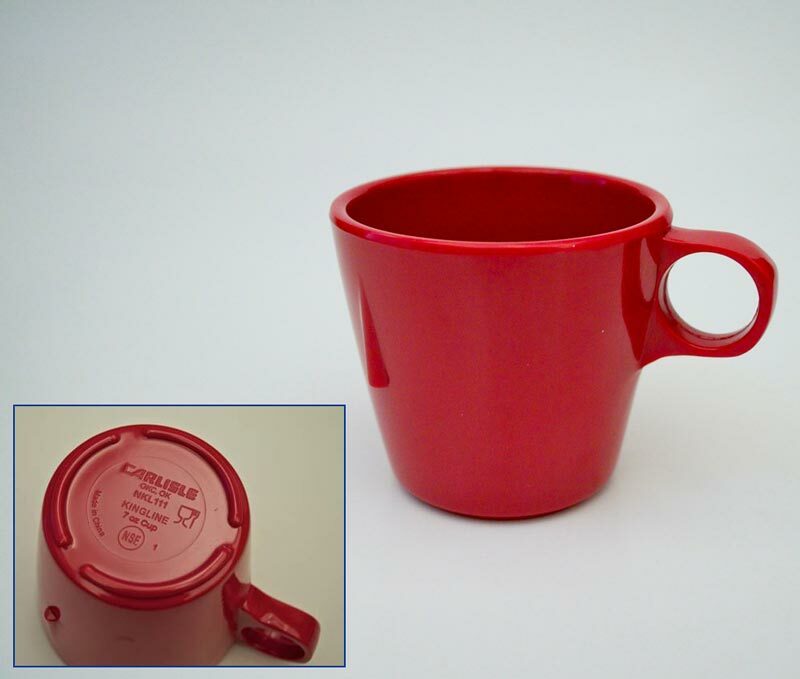 43546 This recall on 2/22/2012 involves Dallas Ware® Stacking Cup 7oz. #43546, sold in a variety of colors, including white, green, ocean blue, sand, honey yellow, bone and sunset orange. The mugs are approximately 2 to 3 inches tall and are made of melamine. The bottom of the mugs have the name "Carlisle OKC, OK" and the model number imprinted on it along "Made in China" and "NSF." Some mugs may also include the model name and size, i.e. "Durus 7 oz cup." Read the press release and the customer letter for more information. About 111,000 The mugs can break when exposed to hot liquids, posing a burn hazard to consumers. 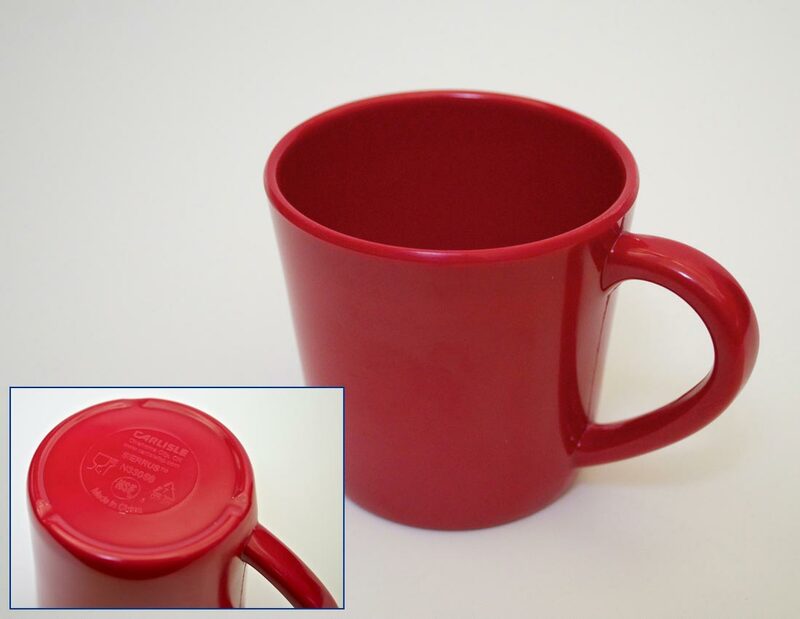 33056 This recall on 2/22/2012 involves Sierrus™ Mug 7.8oz #33056, sold in a variety of colors, including white, green, ocean blue, sand, honey yellow, bone and sunset orange. The mugs are approximately 2 to 3 inches tall and are made of melamine. 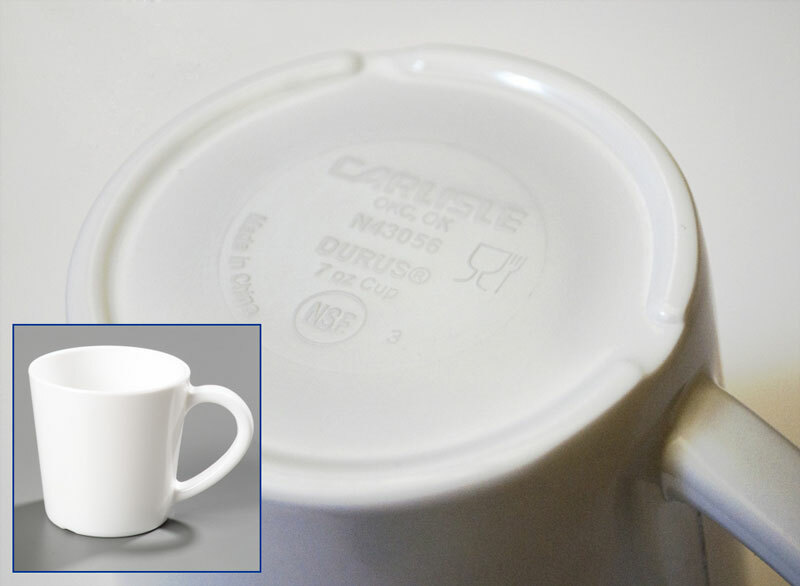 The bottom of the mugs have the name "Carlisle OKC, OK" and the model number imprinted on it along "Made in China" and "NSF." Some mugs may also include the model name and size, i.e. "Durus 7 oz cup." Read the press release and the customer letter for more information. About 111,000 The mugs can break when exposed to hot liquids, posing a burn hazard to consumers. KL300 This recall on 2/22/2012 involves Kingline™ Ovide Cup 7oz #KL300, sold in a variety of colors, including white, green, ocean blue, sand, honey yellow, bone and sunset orange. The mugs are approximately 2 to 3 inches tall and are made of melamine. 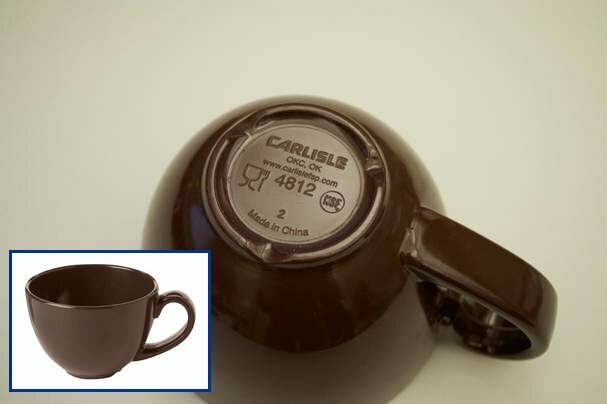 The bottom of the mugs have the name "Carlisle OKC, OK" and the model number imprinted on it along "Made in China" and "NSF." Some mugs may also include the model name and size, i.e. "Durus 7 oz cup." Read the press release and the customer letter for more information. About 111,000 The mugs can break when exposed to hot liquids, posing a burn hazard to consumers. KL111 The recall on 2/22/2012 involves Kingline™ Stacking Cup 7oz #KL111, sold in a variety of colors, including white, green, ocean blue, sand, honey yellow, bone and sunset orange. The mugs are approximately 2 to 3 inches tall and are made of melamine. The bottom of the mugs have the name "Carlisle OKC, OK" and the model number imprinted on it along "Made in China" and "NSF." Some mugs may also include the model name and size, i.e. "Durus 7 oz cup." Read the press release and the customer letter for more information. 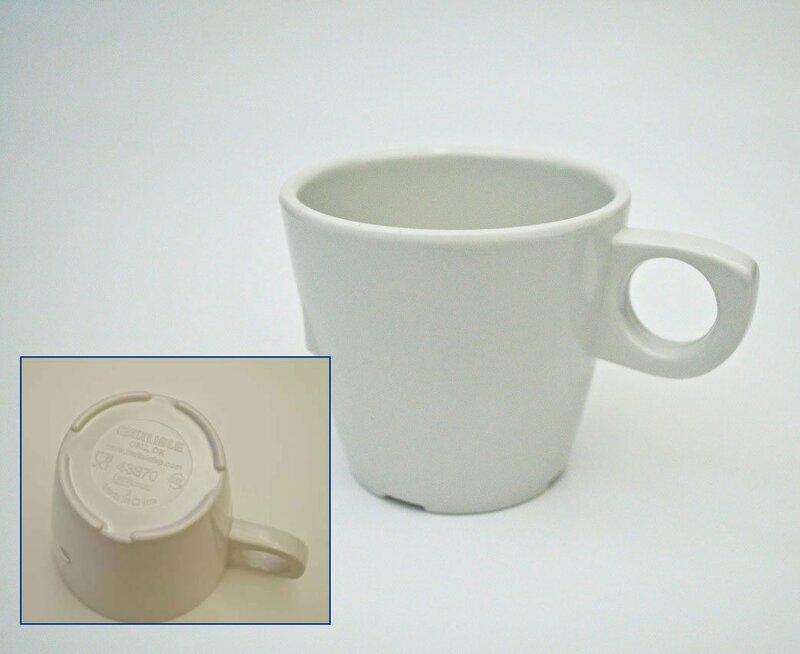 About 111,000 The mugs can break when exposed to hot liquids, posing a burn hazard to consumers. 4510 This recall on 2/22/2012 involves Melamine Stackable Mug 8oz #4510, sold in a variety of colors, including white, green, ocean blue, sand, honey yellow, bone and sunset orange. The mugs are approximately 2 to 3 inches tall and are made of melamine. The bottom of the mugs have the name "Carlisle OKC, OK" and the model number imprinted on it along "Made in China" and "NSF." Some mugs may also include the model name and size, i.e. "Durus 7 oz cup." Read the press release and the customer letter for more information. About 111,000 The mugs can break when exposed to hot liquids, posing a burn hazard to consumers. 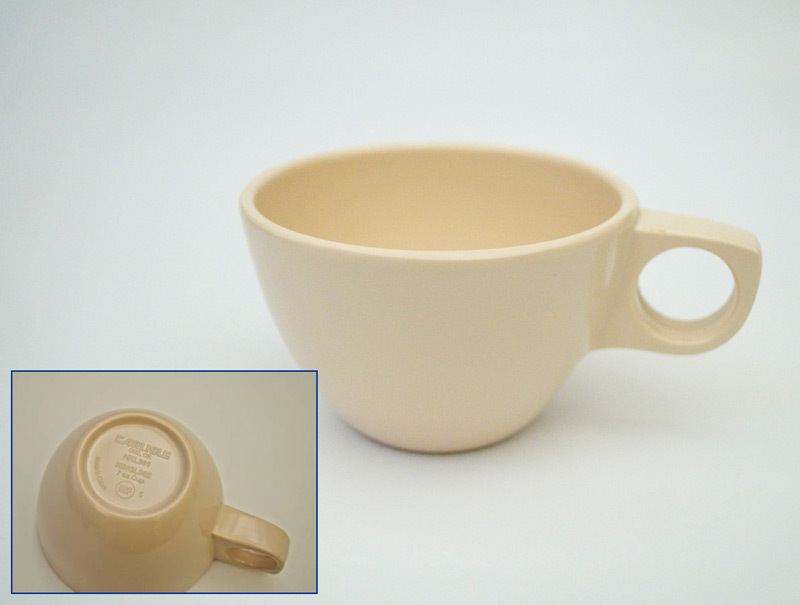 4812 This recall on 2/22/2012 involves Cappuccino Mug 12oz #4812, sold in a variety of colors, including white, green, ocean blue, sand, honey yellow, bone and sunset orange. The mugs are approximately 2 to 3 inches tall and are made of melamine. The bottom of the mugs have the name "Carlisle OKC, OK" and the model number imprinted on it along "Made in China" and "NSF." Some mugs may also include the model name and size, i.e. "Durus 7 oz cup." Read the press release and the customer letter for more information. About 111,000 The mugs can break when exposed to hot liquids, posing a burn hazard to consumers. 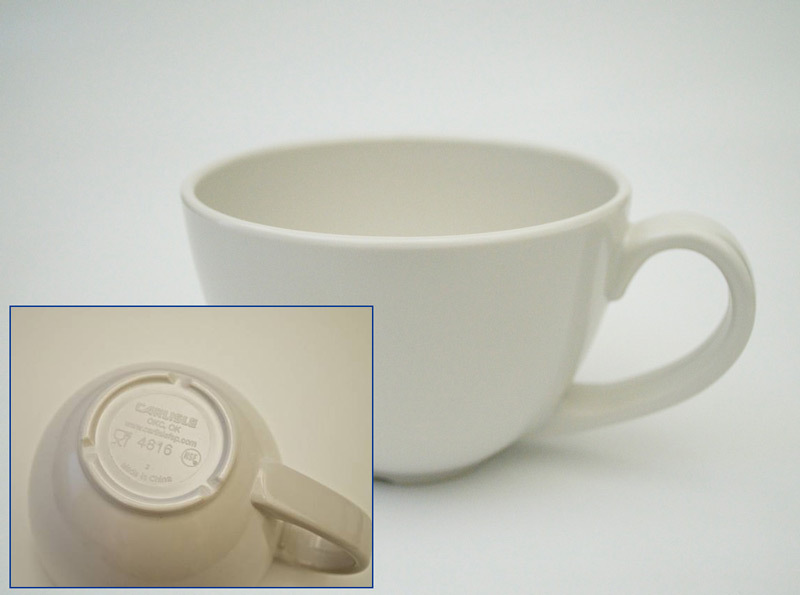 4816 This recall on 2/22/2012 involves Cappuccino Mug 16oz #4816, sold in a variety of colors, including white, green, ocean blue, sand, honey yellow, bone and sunset orange. The mugs are approximately 2 to 3 inches tall and are made of melamine. The bottom of the mugs have the name "Carlisle OKC, OK" and the model number imprinted on it along "Made in China" and "NSF." Some mugs may also include the model name and size, i.e. "Durus 7 oz cup." Read the press release and the customer letter for more information. About 111,000 The mugs can break when exposed to hot liquids, posing a burn hazard to consumers. For any questions, please contact Carlisle FoodService Products via email at productsafety@carlislefsp.com or toll free at (800) 217-8859.